Ever since Captain America: The Winter Soldier came out in April last year, I've been in love with a certain metal-armed assassin. Furthermore, I contend that this metal-armed assassin must be protected at all costs. Here’s why. 1. He’s not a villain. 2. He’s Steve’s best friend. I’m hard-pressed to find a more touching friendship in fiction off the top of my head. From calling each other punk and jerk to the heartbreaking line, “who the hell is Bucky?”, Steve and Bucky’s friendship is deep and multifaceted. And it makes me cry. Don’t we all wish we had a friend like him? Case in point: “The little guy from Brooklyn who was too dumb not to run away from a fight. I'm following him.” When Steve had no one and nothing, he had Bucky. Bucky stood by Steve’s side before he was Captain America. 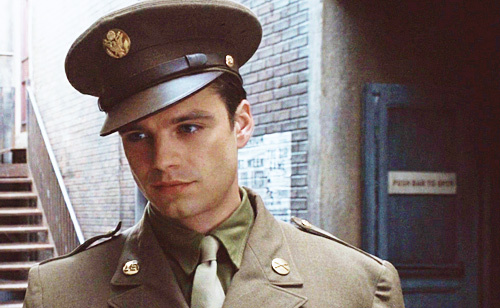 If you doubt Bucky’s goodness, look no further than his loyalty and duty to Steve Rogers. 4. He’s a sarcastic guy, and we love him for it. We don’t get to see much of Bucky pre-Winter Soldier, but what we do see is his sarcasm and witty personality. His dry one-liners are a gift to mankind. So is his smile, by the way. 5. He’s a well-written, well-acted character. Bucky’s character arc is one of my favorite aspects of the MCU. He’s been so brilliantly handled, and his presence and storyline in Captain America: The Winter Soldier greatly helped make the movie fantastic. I can’t wait to see where his storyline goes from here. Falling off a cliff, getting brainwashed by Hydra, and being an assassin are not for the weak of heart. What does Bucky Barnes need? Recovery. Blankets. Hot cocoa. Time to heal. And lots and lots of hugs. Preferably from me, but I’m not picky. Did I miss anything? What are your reasons you want to protect Bucky Barnes? I AM TOTALLY BEHIND YOU ON THIS. I read this Tumblr post comparing Loki and Bucky, saying that Loki is a villain trying to play the victim and Bucky is a victim trapped in the role of a villain. Absolutely. And it doesn't help my slight obsession that I personally ship Nat/Bucky (at least in the past), so that's another reason. PROTECT BUCKY BARNES 2K15. He's also eyecandy. But this is the least of reasons. I am so hopeful that Cap can rescue Bucky soon... Because this is just all correctness, and that is all I have to say about that. I <3 Bucky Barney. He's like the perfect dude to play the Winter Soldier.